Blogging Marathon# 28: Week 3/ Day 1 Theme: Sindhi Dishes Dish: Dal Pakwan My theme for this week's BM is "Sindhi dishes" and I'm going to start it off with a very indulgent Sindhi dish, 'Dal Pakwan'. Traditionally this is served for breakfast, I have to say it is very a filling breakfast that one might skip lunch after having this. To make Dal: Heat 2tbsp ghee or oil in a pressure cooker; add cumin seeds and once the seeds start to splutter, add onions and green chilies. Cook until onions turn translucent. Next add chopped tomatoes and cook until mushy. Add all the dry masalas, cook for 1 minute. Add the soaked chana dal along with 1 cup of water. Cook for 1-2 whistles. Dal should be cooked until tender but should retain its shape. Keep the dal warm for serving. To make Pakwan: Combine all the ingredients and form a stiff dough like poori dough. Cover and set aside for 15minutes. Divide the dough into small lemon size balls and roll them out into 5-6" circles. Prick the circles with a fork. Deep fry the dough circles on medium flame until golden and crispy. Remove on to paper towel lined plate. Repeat with the remaining dough. 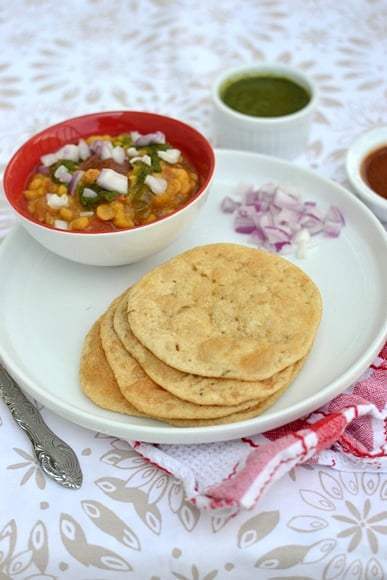 To Serve: Place dal in a bowl and drizzle with the chutneys and the other toppings. Serve with pakwan and ENJOY! !